This is FRESH AIR. I'm Terry Gross. My guest Lidia Bastianich has a devoted following from her public-TV cooking shows and her cookbooks and restaurants. She just won a Daytime Emmy as best culinary host for her program "Lidia's Kitchen." Bastianich has a new memoir called "My American Dream" that describes how she came to love preparing food and how being a refugee and immigrant shaped her life. Those two parts of the story are interconnected. The year she was born, 1947, the peninsula her family lived on switched hands from Italy to Yugoslavia, which was under communist rule. Many of her earliest memories are of spending time in her grandparents' village, where their food came from animals they raised and the vegetables and fruits they grew. It was farm-to-table cuisine poverty-style. She learned a lot about food from her grandmother. When Bastianich was 8, she, her parents and brother fled communist repression, became refugees in Italy and then, in 1958, immigrated to the U.S. When they arrived in New York, they had nothing and couldn't speak English. Bastianich married at the age of 18 and later opened a small Italian-American restaurant in Queens, N.Y. Its success led to other restaurants, including Felidia in Manhattan. Along with her daughter and son, she now owns restaurants in New York as well as in several other cities. Lidia Bastianich, welcome to FRESH AIR. So let's talk about your life. You spent the first few years of your life on the peninsula of Istria on the Adriatic Sea. It had been part of Italy, but after World War II, became part of Yugoslavia. It's now part of Croatia. Your parents lived in the city of Pula, your grandmother in a - your grandparents in a farming village, Busoler. Your grandparents had pigs and chickens and goats and a big garden. And a description that sticks in my mind that I want you to talk about is one in which one of the family pigs is being butchered, and then you describe how every part of the pig is used and turned into food or something useful. So can you just describe some of your memories from the live-pig-to-the-table? (Laughter) Like, that process. LIDIA BASTIANICH: (Laughter) Well, I - yes. I can go way back. Every sort of February, we would go to - Grandpa and Grandma would go with a horse - actually, donkey-drawn cart, and we would go to an animal fair. And there, my grandfather would go around. And there were pens set up in a park situation where little piglets were for sale. And he would choose and really be careful about choosing. He would usually choose two little piglets and, you know, kind of pick them up, stretch their legs, see that they would grow into big pigs because that's what you want. You know, when you slaughter, you want a lot of meat and the bacon and the fat. And all of that was needed for the family. And then he would choose two. We would put it in this little kind of basket and bring them home, and they would squeal all the way home. GROSS: So these were slaughterers, butchers? BASTIANICH: I did. You know, us children - children were always part of what was happening. It wasn't like, oh, put the children away, you know. You were just part of life. And yes, when they picked up the pig, you know, the - usually Grandpa and some other kind of neighbors pick up the pig, each one by one of the legs, and brought it up on this plank. Of course, the pig was squealing or whatever. We knew the time was coming, so us kids would run, hide. And then, of course, we'd come back out and peek and see what's going on and then run again. GROSS: ...Raisins and nuts and things in it that - to make a blood sausage? GROSS: Wait. Wait. I'm going to stop you because part of your job was cleaning out the intestine so that it could be used for blood sausage. That must have been an unpleasant job. BASTIANICH: Well, it was. And I would say, you know, not the children always, just kind of the women - was the women's job. You know, one of the first things - it was very carefully done because you don't want to puncture the intestines and have all the inside of the intestines, that sort of digested feces, all of that. You wanted it intact. So you had to pull the whole intestines out. And that's what came out first - the heart, the lungs, the intestine, all of the innards, if you will. And then the intestines slowly, the large intestines, the small intestines, everything was kind of separated and cleaned and cleaned thoroughly from the inside. First the solid came out and then washed in and out of the inside. And then they were soaked in water and vinegar to some extent. And then they were used as a casing for this blood sausage or for the regular sausages. GROSS: We have just lost the entire vegan audience. (Laughter) They're never going to listen to our show again (laughter). GROSS: ...Now we have to kill them? BASTIANICH: We did. As children, we did. We had the same - in the same sort of cycle, the chickens, the ducks, the rabbits, the goats. You know, I loved the bunny rabbits, the small rabbits. When they came, we played, and we cuddled them and whatever. And, you know, two weeks later, they were part of the dinner table. And somehow, you - this cycle of life, you accept it. You bond. You learn. You connect. You help to raise these little animals, and they become adult animals or - and they become food. And, you know, when food is scarce, every morsel is really appreciated. In a sense, you know, you are grateful to these animals. You know, you kind of celebrate them in a way because they are giving us life. And I think that the caveat here is respect, respect for food. Yes. We need to eat food, but let's, you know, not waste that at all. Let's respect the animals that feed us and so on the line. I think that's what - the important element here because I continue to - you know, certainly cooked all kinds of meats and all that. But I love animals, and I respect them. GROSS: Do you still make blood sausage? BASTIANICH: No, because it's very hard to get - you don't get - you need really direct blood without - now, you know, you can't sell just blood. It has to be pasteurized, and that meaning - you know, it changes the texture. And you don't get it as fresh. By the time you get it, you know, even though it's pasteurized, refrigerated, frozen or whatever, it takes a period of time. And, you know, I don't relate in the same way. GROSS: Yeah. If you're just joining us, my guest is Lidia Bastianich, who's famous for her restaurants and her cooking shows on public television. She has a new memoir now called "My American Dream: A Life Of Love, Family, And Food." We'll be right back. This is FRESH AIR. GROSS: This is FRESH AIR, and if you're just joining us, my guest is chef Lidia Bastianich. She has several restaurants. She's had cooking shows on PBS. And now she has a new memoir called "My American Dream: A Life Of Love, Family, And Food." So you grew up on the peninsula of Istria on the Adriatic Sea, as we said before. And after World War II, it switched from being part of Italy to being part of communist Yugoslavia. The language where you live changed to Croatian from Italian, and the secret police were keeping an eye on your family because - go ahead. BASTIANICH: Yes, absolutely. And the whole thing changed. Now, I was just born in that period, so, you know, I didn't notice this immediate change. But what I did notice in growing is that there was two parts of my existence, and that was the secretive part in the house, whispering in Italian, sometimes talking about religion, and then the oppressive side, growing under communism and having to follow the communist dogma. They changed our names. We couldn't speak - I couldn't speak Italian openly, certainly not go to church. My mother was an elementary school teacher, so she was really watched - and so, you know, the whole kind of anti-democratic dogma and this adoration for president or Josip Broz Tito and, you know, the kind of one-for-all communist doctrine, if you will. You know, everything became communal. Farms were taken away. My father had a business with two trucks, and, you know, he certainly was deemed a capitalist. The trucks were taken away. He was even put in prison for about 40 days until they clarified that he didn't have other alternative motives of, you know, kind of undermining this communistic dogma, that he wanted, you know, to profess capitalism and so on. So it was a tough, tough period. And that's why we ended up spending a lot of time in Busoler with my grandmother and in the courtyard, which for me was idyllic. GROSS: And that was in part because in the countryside, in this village where she lived, it wasn't patrolled by the secret police like the city where your parents were - was patrolled. BASTIANICH: Yes, exactly. You know, the town was quite small - I mean, one main road and houses on each side. Everybody knew each other. Everybody had a little plot of land. GROSS: So your family decided that they needed to leave and actually get to Italy. BASTIANICH: Well, yes. And my family, after they - my father was being kind of followed and all that - decided that maybe - and that took about eight, nine years, you know, because we were sort of grown by then, and I guess they felt they could go into the world with us - that's my brother and I. He was three years older than I am. We had - there was the border, and of course, on the Italian side, we had some family that was kind of left on that side, and we were on the other side, on the communist side. So my mother decided that supposedly, our aunt, our great-aunt Nina in Trieste was not feeling well, and so we got a visa. And that's only the three of us - my mother, my brother and I. My father, they wouldn't give a visa. He had to remain, you know, as a hostage, in a sense, so that the family wouldn't not return. We went to Trieste, visited the aunt, stayed with the aunt. And, you know, the aunt looked fine to me, but we were just excited to be in Trieste. And then about two to three weeks later, my father escaped the border, literally walking about 50 kilometers, crossing the barbed wire fence with the dogs. They were shooting at him, but he made it. And we reunited in Trieste in 1956. BASTIANICH: Well, we - our visas did. My father had no papers at all. GROSS: Right, so - yeah. So you needed to, like, go to the police and become official refugees. BASTIANICH: Well, yes because had they caught us - you know, had the police stopped us in the street and we had no papers, then they would have taken us as some sort of political intruders or, you know - and they could have repatriated us. So my parents made sure that we went to the police officially and declare that we didn't want to go back to Yugoslavia, that we'll remain as refugees. GROSS: So you were given housing in the San Sabba - what should I call it, complex? - that used to be - during World War II, it was a concentration camp. And I didn't even know there was a concentration camp there. GROSS: You didn't know it was a concentration camp when you live there either, right? BASTIANICH: We didn't. We didn't. It was sort of a transfer camp, holding camp or whatever you call it. But it was - before that it was a riseria - ricery (ph) in the sense, you know, milling rice and whatever. So that's what it was called, and it was known. But it was - San Sabba was, before being a political refugee camp where we ended up in, was a Nazi camp - concentration camp. It wasn't a big one, but it was. And in 1956 when we came, it became a political refugee camp for all the refugees escaping communism from Eastern Europe that came through Trieste - that was sort of a holding place. GROSS: Had there been a crematorium there? BASTIANICH: They say that it has, that there's the signals of a chimney and all of that. And I mean, I saw the chimney when I was there. But, you know, no mention was made of anything. And certainly, you know, at my age, I guess they wouldn't tell us that, or maybe they just didn't. I think the aftermath of the war was very sensitive for everybody, and everybody was at edge, if you will, especially in that area. BASTIANICH: I was 10 - from 10 to 12. GROSS: ...A Catholic school. You were taught by nuns. And you worked in the kitchen with the nuns. And you said that their food began to heal you. What did you learn from the nuns who you worked with about preparing and serving food? BASTIANICH: So in the camp, we were held in there until they vetted us. And they found out that, you know, we weren't spies - that we were just this simple family and actually of Italian heritage that wanted a new life. So they gave us a kind of a last ship (unintelligible) permit to leave the camp certain hours of the day. We had to check out and check in. And my mother was given an opportunity by a family - a woman that had an autistic child. And she wanted my mother, as a teacher, to spend some time and teach and talk to the child. And in turn, she subsidized my schooling in the convent that was actually right close to her house. And in that convent, I was - I just loved it because I began to sort of interact with other children, speak Italian. And the religion came back in my life. The nuns took me under their wings, knowing that I was a child that, you know, had not been educated in their religion - in our religion because of being under communism. So it was a great setting for me. And also to sort of help subsidize my schooling, they put me in the kitchen. I don't know why. But I guess they sensed, you know - and the kitchen was more of what I did with Grandma - you know, kind of peel potatoes, apples. But it was, for me, the first kind of entree into a commercial kitchen. Seeing those big pots - they were cooking lunch for all of the students and for the nuns. So it was fun to kind of be in the kitchen, help the nuns. And I even felt kind of special that I was the - even though I was an immigrant, that I was the child that they chose to put in the kitchen. GROSS: So I imagine you learned things that you could later apply in a restaurant? BASTIANICH: I, yes, actually built the base. But, you know, what I think really - and in retrospect, thinking back about my passion of food, my - why am I so connected to food? Why? It goes back, I think, to when I realized that I - you know, I'm not going back to grandma. I'm not going back to Busoler. And for me, it was, you know, unfinished business. I didn't say goodbye to Grandma. I didn't say goodbye to my animals. I didn't say goodbye to my friends. And slowly, food became the substitute - the connector. I would cook foods that Grandma cooked, you know, even if it was as simple as polenta and milk in the morning, which was usually our breakfast. Those flavors, those aromas brought grandma back to me. And, you know, I continued to cook with this kind of desire to connect and to remain connected. 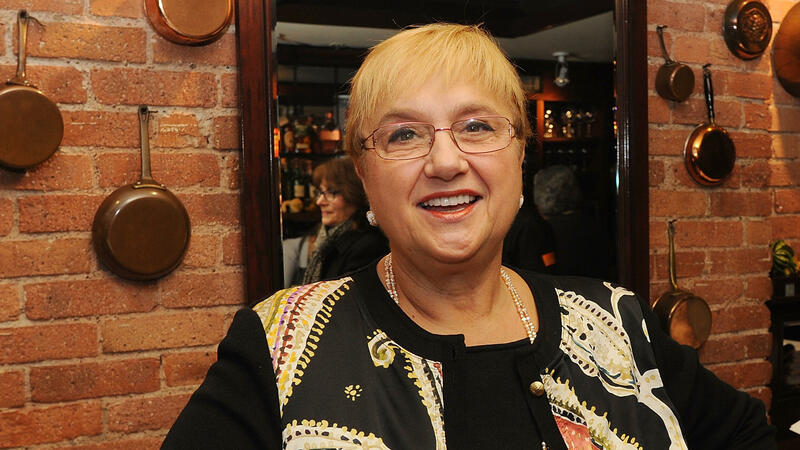 GROSS: My guest is chef, cookbook author and restaurateur Lidia Bastianich. She hosts the PBS series "Lidia's Kitchen." After a break, we'll talk about coming to America and turning the peasant food of her childhood into dishes for her restaurants. And John Powers will review a new novel by Rachel Kushner in which orange is not the new black. I'm Terry Gross. And this is FRESH AIR. GROSS: This is FRESH AIR. I'm Terry Gross, back with chef Lidia Bastianich who's known for her PBS cooking shows, her cookbooks and her restaurants. Last month, she won a Daytime Emmy as best culinary host for her PBS show "Lidia's Kitchen." She has a new memoir called "My American Dream." The year she was born, 1947, the peninsula her family lived on changed hands from Italy to Yugoslavia, which was communist. Her family fled communist rule when she was eight and became refugees in Italy. So in 1958, you and your family immigrate to America with the help of Catholic Relief Services. And Catholic Relief Services emerges as the real hero of this book in your life story. They helped you get passage to America. They found you a hotel room to stay in when you first arrived. They found a house - or an apartment for you to rent. Afterwards, they helped your parents find jobs. They gave you money. And they didn't want to be repaid. Even though your mother insisted on repaying them, they wouldn't accept it. But anyway, so you were how old when you came to America? GROSS: ...Like, an outsider, a newcomer without any facility with English. And it was, I imagine, pretty hard for you. And you still had to deal with food, but with food in a foreign country with very little money and no garden or animals or, you know, fruit trees or (laughter) any of that to deal with. So how did the world of food change for you in America? GROSS: ...Buy Yodels all the time. I thought there were a little, I don't know, bitter or something. They look like they'd be really sweet, and I thought that they didn't taste quite right. I was never a big fan. But you loved them? GROSS: Wrapped in tin foil (laughter). GROSS: Wrapped in, like, a tin foil wrap. BASTIANICH: Yes. Yes. Yes. Yes. And so I was amazed by all of that, and I was excited. So food was different. Peanut butter and jelly - I still like it today. And sometimes, you know, at night, peanut butter and jelly and a glass of milk - I like it. BASTIANICH: Well, you know, it made me so successful. Yes, my mother worked late because first we settled in New Jersey, and then we moved to Astoria, and - but she kept her job in Jersey because she was afraid she wouldn't get another job. And so she came home just in time, 6 o'clock, for dinner. And she would prepare for me just like a regular recipe - you know, the potatoes, the beans, whatever it was that I was cooking - put it in, cook it half an hour and so on - all the instructions. So I would do that. But then I discovered the cake mixes, these wonderful kind of boxes that you add in one egg to that mix or maybe some butter, put it in the oven, and voila, this fluffy, delicious cake would come out. And then, you know, even the icing - they gave you on the side how to make the icing with powdered sugar and whatever. So I was thrilled. And I - almost every night, we had a cake for dessert. Now, that was the good life for us. You know, we weren't used to that. And it made me kind of - oh, I'm an accomplished cook. I made a cake with every dinner. It was great. GROSS: (Laughter) Were you used to anything that sweet? BASTIANICH: No. No. No. We didn't have that many sweets, candies or that. So the whole thing was kind of a discovery. GROSS: So you became engaged at age 18 to Felice Bastianich. You and your husband decided to open a restaurant in Queens, N.Y. Was that a tough choice for you? Because it's a big investment. It's a big responsibility. And you never know what's going to happen when you start your own business. BASTIANICH: Absolutely. But, you know, my husband - he's - also was an immigrant from the same area. He had come before me as a man, a young man, and was working in restaurants, had worked up to being a maitre d', was frugal, saved some money and worked very hard. So we had some money. And taking challenges - I think maybe that was the beginning of, you know, together, especially if you take it with somebody if you're the same mind. Then I had my mother, my father, who always kind of with us in the same home. They had their own apartment but lived with us. They encouraged to - you know, we'll help you or whatever. So when you have that support and you see the opportunity, the challenges, you want to try. And you're young. So we weren't really afraid although, you know, it took for this little restaurant, nine-table restaurant in the suburbs of New York - it took all of our savings. Then I ultimately ended up in the kitchen as a sous-chef learning much more. GROSS: Was the menu in your first restaurant an Italian menu as you understood Italian food to be from having lived in Italy? Or was it an Italian-American as Americans understood (laughter) Italian food to be? BASTIANICH: Yes. Yes. It was Italian-American because, you know, we had worked in restaurants. Most of them were Italian-American food. We had done our research. You know, the successful Italian restaurants all had Italian-American fare, so we weren't going to be different. You know, we were going to go along. We hired an Italian-American chef, and that's when I became the sous-chef and worked with him in the kitchen and learned Italian-American cuisine. And we were quite successful. But, you know, I must say that slowly, I began adding some of the specialties that we ate at home. GROSS: So after having your restaurant in Queens, you expanded that restaurant into the store next door, and then you opened yet another restaurant and then sold those to have a restaurant in Manhattan. Why did you want one in Manhattan? What did that signify to you? BASTIANICH: Well, Manhattan was the epicenter, you know, of this big city with everything that was sort of up and coming in the world of style, of music and of food. And Felice, my husband, had worked most of his time in Manhattan in elegant Italian restaurants. And sort of, you know, his clientele - oh, Lidia and Felice, you need to come to Manhattan. That's where you belong. Your food - and of course that was the draw - and also being in the big times, if you will. Manhattan was being in the center of everything, in a sense. And that's when the press and people in the industry really began to notice this Italian woman chef that cooks odd Italian food. GROSS: ...But they were being served in an expensive, elegant restaurant. BASTIANICH: Yes, absolutely. But that's the reality. You know, you can place food. You can even manipulate it. And much of it is being done by chefs today. But I was kind of true to form because, you know, that message way back - this is who I was. And this is who I wanted to present - you know, the Lidia that came from that area and the Lidia that is now in America and wants to connect her two cultures together. So I cooked the reality of, you know, real peasant food but presented it - great service. You know, we had our sommeliers. So we brought the simple dishes to a level of service and presentation that was above what would be in the home. GROSS: If you're just joining us, my guest is chef and TV host Lidia Bastianich. She has a new memoir called "My American Dream: A Life Of Love, Family, And Food." We'll be right back. This is FRESH AIR. GROSS: This is FRESH AIR. And if you're just joining us, my guest is chef and PBS host Lidia Bastianich. She has a new memoir called "My American Dream: A Life Of Love, Family, And Food." And it tells the story of how she became a refugee and then an immigrant to America. It has her whole, like, food autobiography in it and tells how she became a chef and a TV host. Were there many women chefs when you became a chef? BASTIANICH: There were not that many, but there were - you know, Joyce Goldstein, Barbara Tropp, Mary Sue Milliken. All of those were women that were really kind of, you know, working in our industry and that were good. But it was - you know, it's a tough industry for women. It still is. BASTIANICH: I think that, you know, maybe it's an industry that has been dominated by men even though, you know, for me maybe I took it a little lighter because in Italy women are in restaurant kitchens, and their husbands are outside. So it wasn't - but beginning with France and America, the position of chef - if you will - was dominated by men. Men made it into a profession, and they took it over from women. And, you know, it was their domain. And, you know, they felt the kings of their kitchen. And they really practiced that. So it was tough for a woman to grow into position in a restaurant. GROSS: It's kind of hilarious in the sense that it was always like - in the traditional gender days, like a woman's job is in the kitchen cooking food. That's not a man's job. But once there was like pay and prestige behind cooking, oh, that's a man's job. BASTIANICH: They just took it over from us. And, you know, I always- I'm very much involved in women's organization. And, you know, I found that also women chefs and restaurateur - I always say, you know, you just got to make yourself. Invest in yourself. Be a professional. Be as good as you can be. Go out there and get the position. Make it happen. BASTIANICH: You know, it's a sad subject, and it is real. There's - maybe because of my matriarchal - if you will - position, I was always looked on with respect. But, you know, as I said, you know, I tell women in the industry - and for that matter, everybody - you need to give respect, and you need to actually demand and get respect back. Have I seen it? I think, you know, it's unavoidable to see different things. And I corrected it along the way as much as I've seen. But it really makes no difference who the person is. It needs to be addressed immediately. It's like an apple. You must take the rotten part out. Otherwise, the whole apple goes. GROSS: You and your husband separated in 1997. He died in 2010 at age 70 of complications from diabetes. And when I read that, I couldn't help but wonder if he was diabetic when you were in the restaurant business together. BASTIANICH: He was. Part of it - you know, I guess maybe it's later onset of diabetes. You know, the restaurant is a unique place where you could go off course in many different ways - whether it's drinking, overeating, eating too many sweets and so on, eating late and so on. So he was a diabetic in the restaurant and moving on then for the rest of his life. GROSS: How did you deal with being around food all the time? Like you said, like all chefs have to find a way of dealing with this. BASTIANICH: Well, I still deal. You know, I just love food. I love eating. I love, you know, pasta. It just gives me so much pleasure in cooking it and sitting down with people, sharing it, enjoying it. So you know, like everybody else, I have to monitor as much as I can that I balance it out, you know, because I think that a lot of the problems - you know, food has been maligned as being the cause of so many problems. And I guess if you abuse it, it does. But food is positive. Food gives you life. Food gives you satisfaction, pleasure. It just nurtures you. And so learning how to best kind of be in sync with food and what you eat and what your intake is that we each have to do for ourselves. And, you know, our needs as humans changes. And we need less of something - you know, I remember certainly when I was small there was a lot of starch involved because starch was maybe the cheapest, because it filled you up, because it gave you energy as a child. And you begin to really love it. So a plate of pasta for me is the ultimate. GROSS: So for years, your PBS show "Lidia's Table" was shot in your kitchen in your home. What was it like for you to have your home become your TV studio? BASTIANICH: Well, you know, how that happened, it was really unique. You know, I say that my life is made of opportunities that were presented and me taking - feeling, oh, I can do that; I can do that; and moving on, forging ahead. So as far as television, when I was the chef in Felidia, one of the person that came was Julia Child. And with her, also James Beard came for dinner. And she was very interested in risotto, how to make it. So we became friends. I taught her how to make risotto. And we continued our friendship. She asked me to be on her show, the "Master Chefs" series. And that's when the producer says, Lidia, you know, you're pretty good. How about a show of your own? And that is 20 years ago. So I thought about it. She encouraged me. She says, Lidia, you go ahead. You do for Italian food what I did for French food. You can do it. And I asked the producer for two things. And that was that I'd be on PBS because, you know, the platform is second to none for information, and that's where I wanted to be. And the second request was that I tape it in my home. And that was purely because I was afraid of getting in a studio. I was never in a studio. I didn't know what the studio - cooking in the studio entailed. And I said, in my home, I know my stove. I know where everything is. And so it began. And for 15 years, you know, the shows are in my home, in my kitchen, you know, where my family lived and came and went. And that's why they were so included in the show. But then my mother, who's now 97 - and she lives with me - you know, I felt it became dangerous for her to have all the cables all around. And we moved to a kitchen showroom, Clarke's kitchen showrooms, actually, up in Connecticut. And that's where we film. GROSS: So what's it like for you to hear how immigrants are spoken of today with such, you know, distrust from our own president? BASTIANICH: Well, you know, my story certainly is nonpolitical. But it's a human story. And I can't help it when I watch the television to see those children in camp. And yes, they run. They're joyful. But I know - I know what they feel at night when they go to bed and how they think, what's tomorrow? Is - are my parents going to be with me? Are we going to have a home? Am I going to make friends? You know, am I going to see my relatives again, my grandma, whatever? That - I know that those children have the same thoughts. And so I'm - I feel really connected. And, you know, hopefully me telling my story is a story - a good story. It's a story of somebody that, yes, faced adversity like, you know, a lot of people are facing today, but, you know, given a chance. And working hard and being spiritual and staying strong to those basic values can take you to great places. So I hope that, you know, with this book, that message comes up for many people maybe that are wondering. GROSS: Lidia Bastianich has a new memoir called "My American Dream." After we take a short break, John Powers will review a new novel about a young woman in prison. This is FRESH AIR.